Spring in Texas... ah, what can I say! It. Is. Beautiful. The weather is sunny and warm, the cadence of birds in the trees is music to everyone's ears and it is green everywhere! Now if this weren't pretty enough, all of the wildflowers are in bloom. Beautiful patches of pink, purple, orange, yellow and white flowers popping up everywhere, and then to top it all off are the Texas Bluebonnets. Fields and fields, in some cases as far as the eye can see, cover the Texas country side. And we down here in Houston are lucky enough to be right in the middle of it all. It has become somewhat of a tradition down here 'deep in the heart of Texas' to make a yearly trip to the Bluebonnet fields dressed up and with a camera in tow to take a photo. It seems to me the enigma of these blue beauties is that they disappear about as quickly as they pop up. Their bloom span is about 3 weeks and then...gone! Now some people may say, "what's the big deal with a bunch of flowers", but until you've stood in a field of them, you will never know. And once you have, you'll be hooked forever! Because I have not lived in Houston, Texas, or even the US for most of my life, when I moved down here, I had obviously never heard of the Texas Bluebonnets. The first March/April that we were here, I heard some people talking about these amazing fields and I just had to find out what the fuss was all about. Well, I found out soon enough. At the time Miss J was only 6 months old but I packed her and my hubby up anyway and we drove around until we found them. They were so beautiful, and ever since then we have made the excursion to take a family pic every year. I think it is very important when you are not from a place to immerse yourself in the culture and traditions of that particular place, and in this case, we have made these beautiful lovelies a part of our tradition. We had a very good experience with the Bluebonnets this year. A couple of years ago we drove around for hours (much to my husbands joy....) to find a good field of them, but this year it was easy to find them and they were beautiful. The girls loved running through and dancing in the thick flowers. Last year when we took Little B she was only 2 months old with no clue of what was going on, but this year she was entranced. It actually took a while to get a good picture of her because she wouldn't stop staring down at the little blooms. 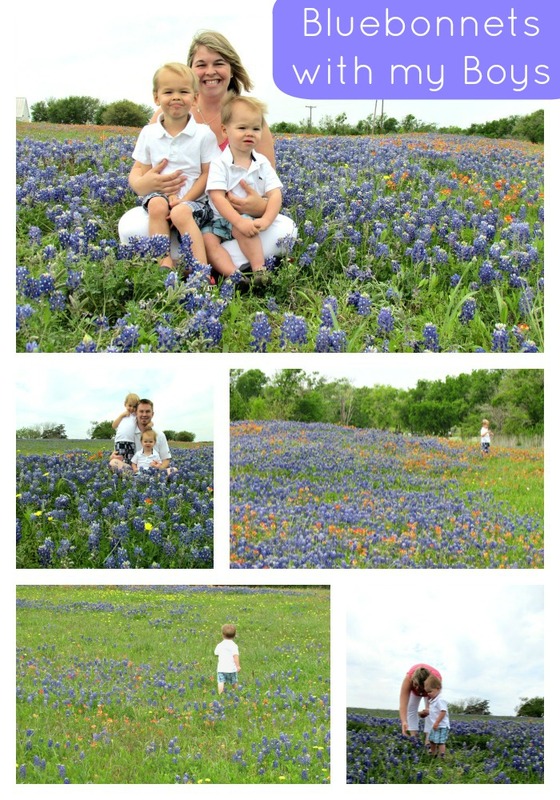 This was the first year that we were able to take Bluebonnet Pictures with my youngest son. Due to the drought last year, we were unable to find any large fields and drove home very disappointed. But this year was a whole new story! Jamie told us about a wonderful field that she had come across with her family, so the following weekend we set out on a little drive into Bluebonnet Country. I was so nervous we were going to miss the Bluebonnets this year, because we went on vacation at the end of March - prime time for these beauties! Alas, I was super happy to come home and they were in full bloom! I remember making trips to Brenham as a kid to see the bluebonnets, but we never got out to take pictures, at least not that I recall. I don't think it was a big event way back in the stone ages as it is now. Now that we have kids of our own, I make it a purpose to go and take pictures every year. My husband is always so willing and ridiculously happy to drive for a few hours... to find flowers... and take a few pictures hoping a few turn out. Happy he is. Not really. 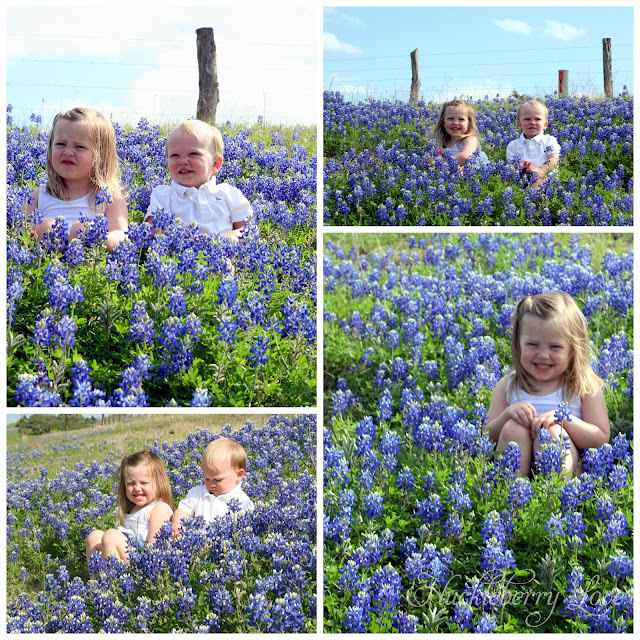 We packed up the kids and drove out to Chappel Hill and came across a very large field of Bluebonnets. I passed it at first because the crowds were swarming. I drove a few more miles then decided to head back and do what we could. 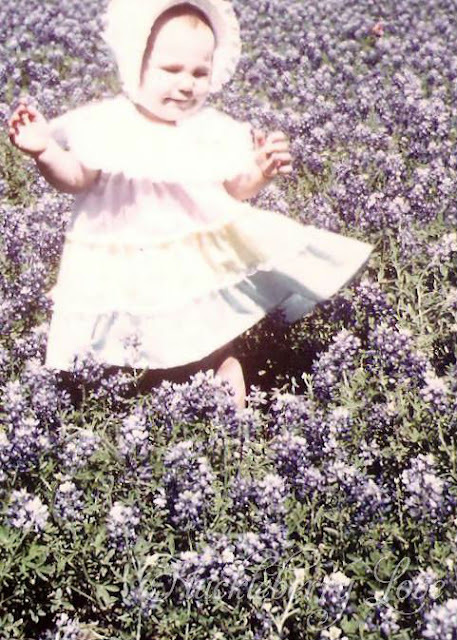 My first bluebonnet experience at 9 months old. Don't you just love that awesome bonnet? Growing up in Texas, it was only spring when the bluebonnets started poking their little blue faces up all along the highways. Within a week or two, the whole side of the road and all the fields would be an unreal, beautiful blue color. And the smell...divine! You could smell it in your car, even with the windows up. It is a family tradition to take photos in the bluebonnets and they started me young. So once I had kids of my own it was no question that every spring we would be cruising the country roads looking for that perfect field. Last year was rough one for our little bluebonnet crop. The drought really affected our state flower and even after hours of searching we ended up empty handed and with no bluebonnet pictures. However, they made up for missing last year by blooming extra sweet this time around! This year, we stopped on way back from Round Top, a small Texas town that holds a bi-annual antique show. We ended up stopping along the side of a road with a large hill covered with the sweet-smelling flowers. Since we were close to a road, we didn't let the kids run around like they wanted to and Daddy had to play interference (much like wrangling cats). We did manage to get a few good shots and honestly, the outtakes make me laugh even more than the pictures that turned out. Since this was Corbin's first year to see bluebonnets, he couldn't stop touching them, smelling them and pointing them out to me. I think he even ate a few of them. After we left, he talked about the "blue flowers" for days. 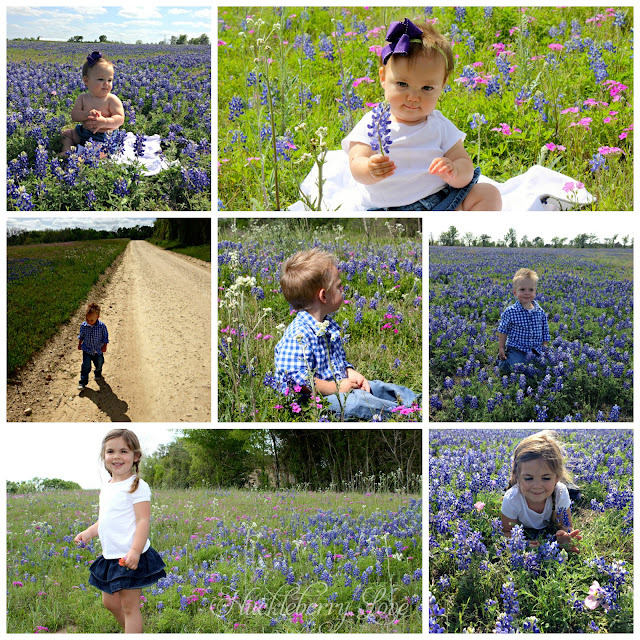 I LOVE our Texas bluebonnets and am so so happy that we were able to get some pictures with the kids this year. Here's hoping that next year's crop is just as breathtaking! Almost half of our pictures have Daddy in them, as he tried to coax/manhandle our kiddos into picture perfect poses. Looking at these, I can't help but laugh. I absolutely love Texas Bluebonnet season! Ever since we moved down to Houston, we have gone each year. 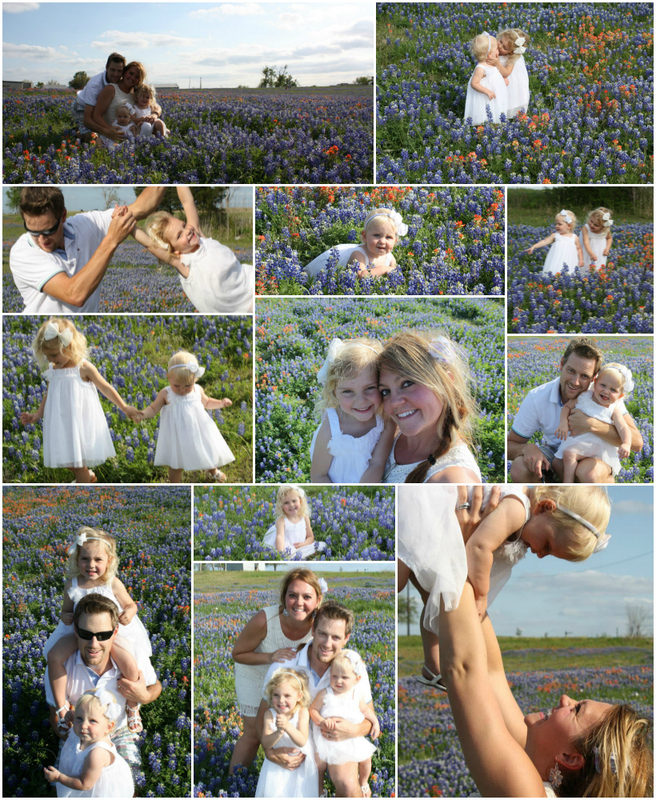 It's one of those family traditions that I'd like to keep up, just to sit down and get some pictures together in a field of gorgeous flowers. My husband actually enjoys going. It's our little family adventure, to drive aimlessly and find the best field that we can. We have a few reliable areas, now that we've been going for three years. I think the best field that we found was down a dirt road, through a canopy of trees, fenced in by a farmer. In true Texas style, we hopped the fence and took pictures there last year. This year, the bluebonnets were gorgeous, but there were quite a few signs posted to keep out. We weren't going to chance it, so we drove around until we found more. And more we found! I am way excited for next year. I already have props in mind...Crossing my fingers for an amazing field and that perfect family photo! Well there you have it, a look into 'our' Texas Bluebonnets! Don't you love them too? Don't forget to post your projects on Much Ado About Monday!! 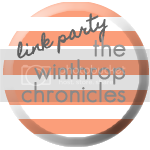 We'd love to see what you've been up to, and who knows... you may be featured this week!